Each year, Australia welcomes an increasing number of international students to study in their universities, institutes, colleges and schools. In 2010, more than 380,000 students from 140 countries studied at Australian institutions, either in Australia or in overseas campuses. The majority of these students (almost 70 per cent) undertook courses in the higher education and vocational education sectors. 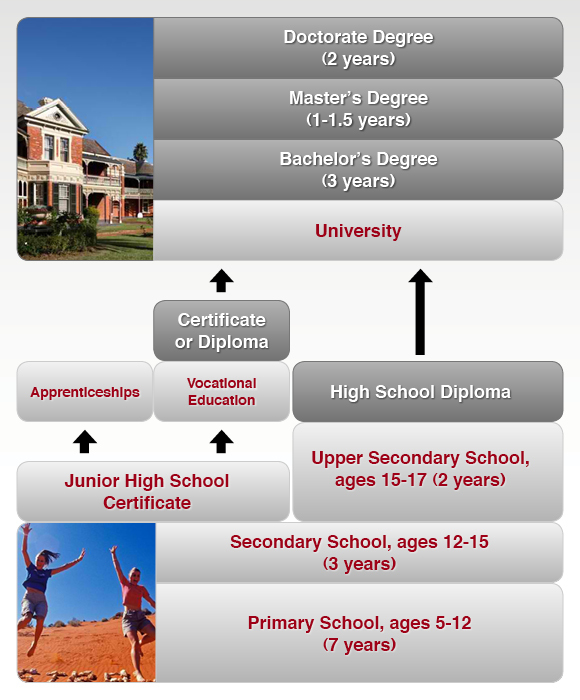 The diagram below shows how the Australian Education system typically progresses, followed by a description of the types and levels of institutions in Australia that are accessible by overseas students. The Australian school system starts with a preparatory year followed by 12 years of primary and secondary schooling. Schooling is compulsory until the age of 16 or completion of Year 10. An additional two years of study are necessary for those wishing to proceed to tertiary studies. In the final year (Year 12), students can study for a government-endorsed certificate which is recognized for further study by all Australian universities and vocational training institutions. There are two broad categories of schools in Australia – government and private. Both accept international students. The school year in Australia is divided into four terms and runs from late January until December. The VET sector is positioned between secondary schools and universities and prepares students for employment or further study. This sector consists of public institutes of Technical and Further Education (TAFE), and private colleges specializing in one or more areas of study related to future work. TAFE Institutes are nationally-recognized, government-funded institutions offering vocational education and training over a wide range of occupations. Courses vary in duration from several hours to three year full-time courses. They are usually cheaper than university courses, and students may progress to university later on with credits for their TAFE studies. Qualifications include certificates, diplomas and advanced diplomas. Inter-Ed works with all the TAFE Colleges in NSW, a wide selection in Queensland, the major TAFE Colleges in Victoria and a selection of TAFEs in the NCR, South Australia, Western Australia and Northern Territories. Private colleges include business colleges, computer training firms, English language centers, and colleges specializing in particular fields such as aviation, photography, interior decorating, multimedia, hospitality management, culinary arts and tourism. Many institutes also provide accredited English language training and Foundation Studies for entry into university for bachelor degree courses. All institutes and colleges are subject to Government monitoring to ensure high standards. 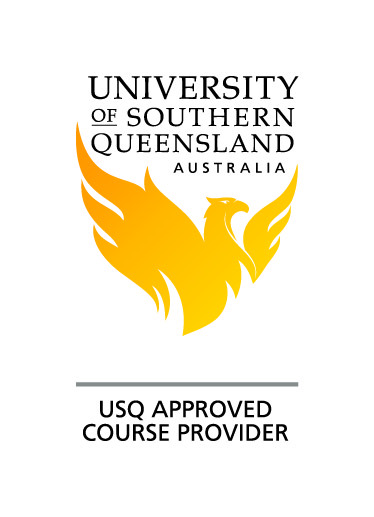 Australia has 38 government-funded universities and two private universities (and two overseas universities), as well as a number of specialist institutions providing approved courses at the higher education level such as ICHM (A Swiss Hotel Management School), Blue Mountains International Hotel School and Le Cordon Blue. Universities engage in teaching and research across a wide range of professional and academic disciplines. These disciplines may be specialist in nature (eg, Medicine, Engineering) or generalist (eg. Arts, Science). University studies can be undertaken at the undergraduate or postgraduate level, leading to awards ranging from bachelor’s degrees to doctorates. Many institutions also offer additional programs such as Foundation Studies, Study Abroad and English language courses and specialists courses such as bridging programs to Nursing Registration. 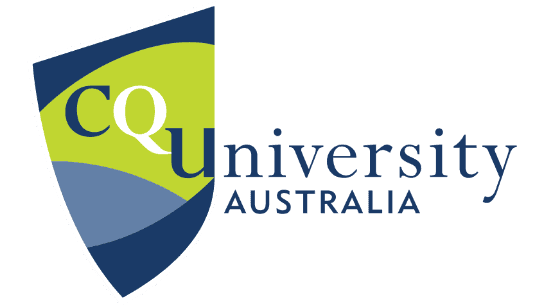 These programs (usually taken over one academic year) prepare international students for entry into Australian universities. Students undertake subjects directly related to their preferred university course, as well as English language training for academic purposes. Successful completion of a Foundation Studies program provides students with a guarantee of admission into specific degree courses within participating institutions. Many schools and vocational institutes, as well as universities, offer Foundation Studies programs, the best known coming under the Navitas Group (PIBT, QIBT, Deakin College, SIBT) and Study Group (Taylor’s Colleges and Eynesbury). These programs give overseas students the opportunity to undertake courses or paid work experience at Australian institutions for one or two semesters and have them credited at their home institutions. Students must gain prior approval for the subjects/work experience they wish to undertake in Australia, and must also meet the specified requirements for these programs. Inter-Ed is the foremost organization in the Philippines running such programs. English Language Intensive Courses for Overseas Students (ELICOS) may be undertaken at a variety of government and private institutions. There are currently over 100 accredited and registered English centers throughout Australia. Courses are designed to include general English language training, English for academic purposes (in preparation for further studies), English for specific purposes (eg, business or computing studies) and preparation for international exams (such as the Cambridge Certificate or IELTS). Full-time English courses are available for periods of study from four to 48 weeks. All students studying or undertaking internships in Australia must go on the correct category of (student) visa. The most common of these are: ELICOS – Sc570; Schools – Sc571; VET – Sc572; Higher Education – Sc573; Research – Sc574; Non-Award Courses – Sc575. For students having visas issued after November 2011 and who will be completing a Bachelor’s, Masters or Doctorate degree over a period of 2 years or more, the Australian government has granted them the privilege to work for 2 – 4 years after successfully completing their studies. They will be eligible to apply for a change of status to a Sub-Class 485 Graduate (Temporary) visa. Typically Inter-Ed processes students’ applications from initial counseling to issuance of visa in 3 – 4 months, although turn-around time varies from institution to institution. The matrix below shows many of the institutions Inter-Ed works with and officially represents in the Philippines. As a general rule, if a university offers a course at Bachelor’s level, it is usually also available at post-graduate level.